Putra Ganapati Vratham is observed by the childless couple for children. The Vrat is very auspicious and main ritual for Telugu people and dedicated to Lord Ganesh. 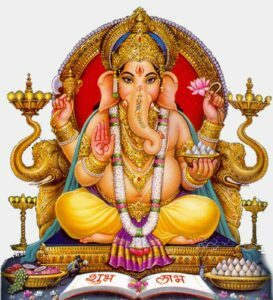 Putra Ganapathi vratam is also called as Vinayaka Vratham or Vara sidhi vinayaka vratam. The Vrat is observed on the fourth day after Amavasya (Waxing Phase of Moon) in Phalgun month, i.e, on Phalguna Shudha Chavithi. Devotees (Childless Couple) should take bath before sunrise & perform Ganesh Puja by chanting Ganesh slokas, Ganesh Ashhtothara Shathanamavali, offer Garika, lotus flowers, Archana & observe fast on this day by praying Lord Ganesha to be blessed with children. Food Offerings to Lord on Putra Ganapati Vratham – Kudumulu, Payasam, jaggery, flattened rice & fruits.